Blue Flamingo is a new and unique combination of cello and harp. Suzie and Catherine are two highly qualified professionals who have recently come together to create this exciting fresh sound. Both have extensive experience in creating that special atmosphere you are searching for, performing functions in stately as well as informal venues including top London hotels, royal palaces and National Trust properties, corporate and private venues too numerous to mention. Suzie is also founder of the Celebration String Quartet, while Catherine enjoyed a ten-year residency playing for afternoon tea at London’s five-star Meridien Piccadilly Hotel, and has played for British and foreign Royalty on numerous occasions. Both have additionally performed with leading orchestras such as the City of Birmingham Symphony Orchestra, BBC Symphony Orchestra at the Proms, and the Hong Kong Philharmonic. Blue Flamingo offers a wide-ranging repertoire from popular classics to the best of modern songs from Gershwin to Stevie Wonder. Suzie often performs on the electric cello which blends perfectly with the harp and has proved very popular for small and large functions and weddings. 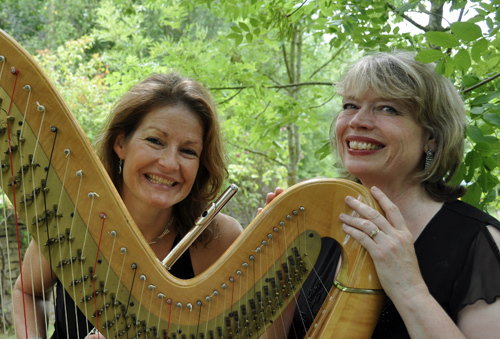 The Cotswold Flute and Harp Duo offers a wide range of possibilities, from a formal recital to background music for your wedding or special event. They have performed together in concert series and at music festivals as well as delighting clients and their guests in more informal background settings with a broad variety of repertoire classical and popular. Diane and Catherine offer impeccable credentials – as concert musicians they have served as principal players with such orchestras as the Orchestra of the Swan and the Ulster Orchestra and have performed as freelancers with many of the finest ensembles in the UK and with internationally renowned conductors such as Sir Simon Rattle and Pierre Boulez. Individually they have performed at major venues, music clubs and festivals, and on BBC television and radio. 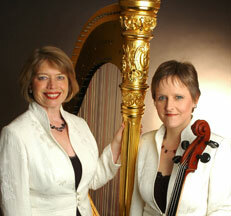 Diane and Catherine both believe passionately in sharing their music with all people. Along with many education projects they are actively involved with outreach work organized by the Orchestra of the Swan, extending the concert platform to a wider audience. Equally, they take pleasure in creating an elegant ambience for your special event.